Our Fourth of July was a little different than usual but still fun. As I always tell my kids: “go with the flow” (or “look for the silver lining,” or “turn lemons into lemonade”). Yeah, I’m as sick of my sappy platitudes as my kids are. Yep, a Futon Shop (if only they’d been open at 7:00 p.m. on July 4, I probably would have bought several pieces of furniture over the years! It was a great spot to see a fireworks display without actually buying a ticket or fighting crowds out of the State Fair grounds. We had this idea with about ten thousand other people who spread out in various parking lots near our Futon Shop. So much for my “no crowds” goal. It really was fun through the years though. When the kids were little, they lit sparklers and hubby (aka, “pyromaniac”) set off a few twirling, spinning things. We would pack snacks and drinks and then usually walk to get pizza and, sometimes, even ice cream. Some years we would be freezing to death but most years we were sweating buckets as late as 10:00 p.m. One year, a sparkler set off a small fire on a sleeping bag. This year, Hubby’s mom is having a heart procedure at a cardiac center a couple of hours away. Since Mom-in-law needs to be at the hospital at 6:00 a.m., Hubby and Mom-in-law are out of town on the Fourth. The kids are grown and scattered (as they should be). 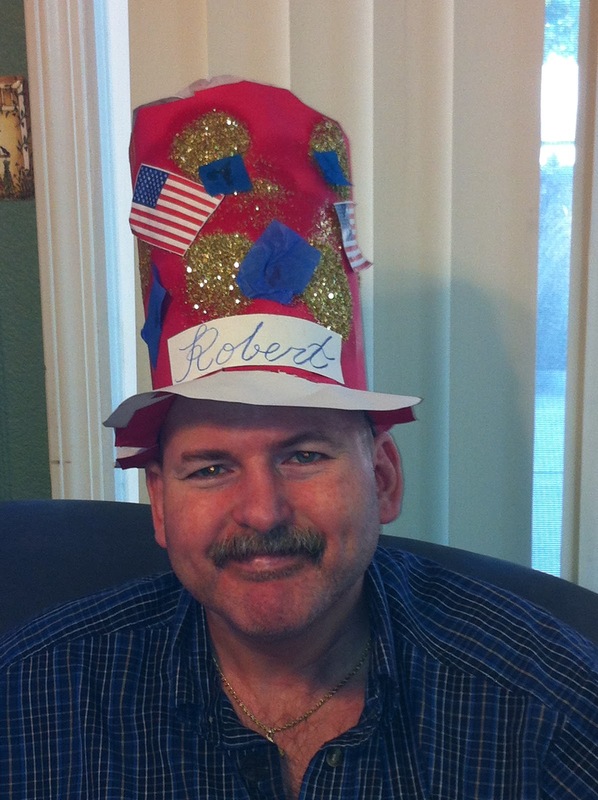 I picked up Robert this morning so he could spend the holiday with family and, brought along his Fourth of July hat he got at his Day Program holiday celebration. By evening, it was me and him, three dogs and a giant party hat. Driving to the Futon Shop didn’t seem like such a good idea since the traffic is horrific and there would be no easy place to take Robert to the restroom if needed. Driving to another fireworks show nearer our house was option number two. Robert ate dinner and went through his usual routine to get ready for bed. Once he was ready and finished watching Jeopardy, I asked him if he wanted to see some fireworks. I got Robert into the car, put his walker into the trunk, scooped up the two little dogs (and blasted all the televisions in the house for the larger dog) and drove to an area close enough to the fireworks display to have a good view but far enough away to be able to make a quick exit if Robert needed a bathroom break or the dogs became too anxious. No need for the early exit. The dogs loved being in the car (and snuggling with me) and Robert busied himself with counting the different fireworks in the show (he somehow got to 200+). I called Hubby to say goodnight, texted Other Brother to see how his holiday was and enjoyed a video he shared of his own fireworks display. I even watched the fireworks. It was no Futon Shop but it was pretty good. After all, you have to go with the flow and things will turn out just fine. Hope everyone had a happy Fourth!